I have observed a way for a person to come to West Africa for 2500 USD, and visit both Francophone Togo, and Anglophone Ghana with the least amount of hassle, but the maximum amount of culture. It would be an easy trip to fly into either Accra, Ghana, or Lome, Togo and travel to Kpalime, Togo and Ho, Ghana; you could visit French Togo and English Ghana without needing to travel more four hours in any one change of location. 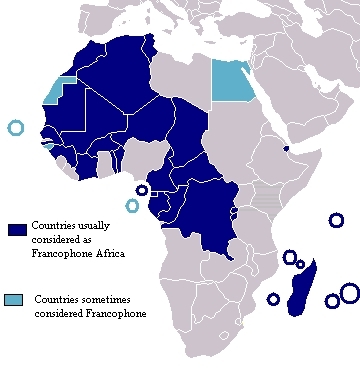 I have been to French West Africa four times the area between Liberia and Nigeria. 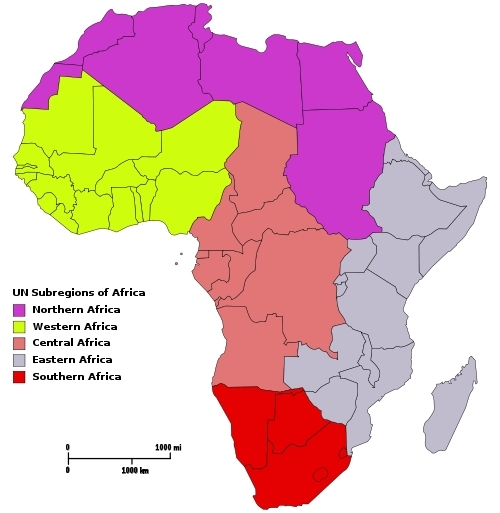 Map of the "major" regions of Africa, then within each major region there are sub-regions to take into consideration. Africa has stepped on it "thingy" and often jumps up and down on it for tourism. 1. Africa tries to tempt the rich; however, the place is more suited for young Backpackers. 2. Africa makes Visas obnoxiously difficult to attain, Nigeria even goes as far as to say you must return to your home country. 3. Transportation is one-step above being picked up by a couple friendly and safe hillbillies with their mother in the car, everything is friendly, but you are uncomfortable. 4. Hotels, Auberges are triple the price of South America, Central or Asia the prime backpacker areas. The writers recommend prices that are four times higher than the average Backpacker price budget. 6. Difficult to dumb it down enough for simple tourism. A traveler to Africa needs to take a lick of Africa, before they take a big bite; they need a small enough portion to eat that could train them to solve all the problems listed above. 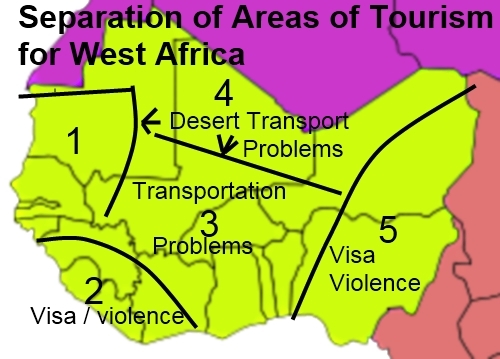 This map shows the five natural areas of tourism, to cross from one area into the other area can become an ordeal because of transportation, visa, language and length of time needed. Because there are natural separates within West Africa, travelers need to plan strategies to visit. My idea of traveling across Cote d’Ivoire into Liberia both crosses what is consider a "violent" natural barrier. --- English are the grey, mixed with the Spanish, Portuguese, Belgium, Dutch, and German, and who knows what else, but the two major or English and French. This is a pain-free self-made tour about any level of experience tourist or travel could do with the least amount of sitting on our butts in vans problems. If you wished, you could hire a private taxi between cities for less than 30-50 dollars and pay too much at that. Kpalime has markets, French, girls, and all the things Africa good and bad, the Mandela a Chambre de Passage would explain the skinny, and the Galion in Lome is full of French Expats, although the place is a beat up Hotel. Ho, is simple, the Tarso Hotel is a top notch Backpacker Hotel, and none better, I have yet to find anything in Accra for Hotels that does not beat me up for comfort, so I am amiss there. The only pain - pain - pain is Accra, the traffic is GO GO --- but slow. They can walk you through the process, and if you are missing a paper or something, they will tell you, truly the simplified way of getting a Visa. Right now, I am considering going to Nigeria, I think I could send with DHL my passport from Ghana to Washington overnight for a Nigeria Visa. The overnight by the way takes three days, it is not overnight unless in the USA. I could then have them send it to Ghana, I feel very confident this Briggs Company can get the job done. I would recommend this company, please note, I am not paid in anyway for telling you this, I just appreciated doing business with them. They can also help you get a passport, but if this is problem, you had better not come to Africa as your first trip "out." 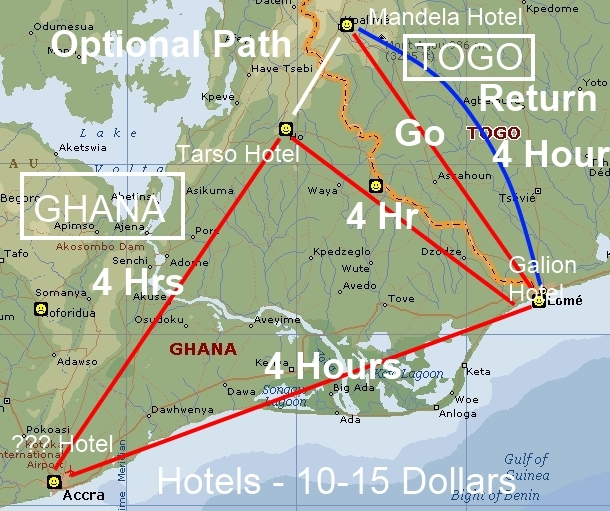 Bend over; you are going to pay big for a plane ticket, Lome, which does have a seven-day Visa on arrival, is going to cost about 400 Dollars more than Ghana, which requires a Visa. Nevertheless, once you arrive, you can live on about 20-25 Dollar per day, unless you drink and drink, which is about 80 percent of people, and then you need to double the budget to 50 USD per day. Truly, this would let you dip your wick in both Frenchie Baguette Africa, and Ghana, think we are British, but truly are not Ghana. I suppose you can do in 10 days, but 20-30 days would be the optimal enjoyment for a tourist who gets bored unless pumped daily with a 10-hour walk with guidebook in hand. I can easily sit in the Hotel all day talking with Ivy the girl in Torso, not a problem, I have minimal needs. Cost from Chicago roughly 1500 for round-trip plane Ticket, 300 for Visa, and 10 days at 50 dollars is 2500 USD rounded up, the strange part, is you could add on another month for less than 100-200 dollars, once you get in Africa you can stay a long-time cheap if you can get the Hotel room problem solved. I buy one-way tickets, so a smaller money bite for me. I am waiting for Christmas and New Years to pass, then I either apply in Accra for a Liberia or Nigeria Visa. I need to access the situation in Cote d'Ivoire, I truly do not want to fly to Monrovia, it would miss Liberia. I would love to go to Cameroon, so I guess a good path also. I have heard people got the Nigeria Visa in Lome.